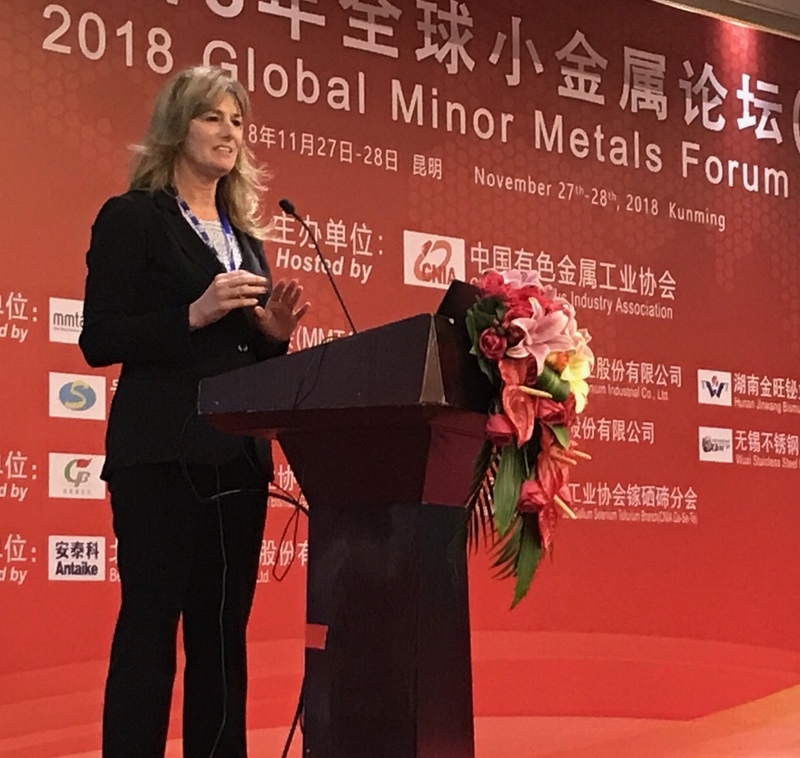 Indium Corporation’s Donna Vareha-Walsh, Director, Metals Business Unit, shared her industry knowledge and expertise at the 2018 Global Minor Metals Forum on Nov. 28 in Kunming, Yunnan, China. Vareha-Walsh’s presentation, Indium Corporation Overview Global Indium Market, reviewed global indium supply and demand, how changes in trade between China and the United States are expected to impact the market for indium metal, as well as environmental regulation changes in China. This year, the forum’s key topic was the minor metals industry inheritance and innovation, with a focus on metals such as indium, bismuth, and germanium. Vareha-Walsh is responsible for the sourcing of critical raw materials such as indium, gallium, germanium, tin, silver, and other products and services that support Indium Corporation’s manufacturing operations, as well as the trading of metals and sales of reclaim services for Indium Corporation’s Korean operation. She has more than 15 years of metals market experience from numerous roles and responsibilities, including Director of Global Procurement for a global premium alloy company and Director of Metallurgical Operations and Procurement for a global tungsten-based business. She also has experience in finance as a Business Unit Controller, sales expertise as Director of Sales and New Business Development Manager, and has participated in metals recycling and scrap/reclaim markets. Vareha-Walsh earned a bachelor’s degree in finance from Duquesne University and an MBA from the University of Pittsburgh. She is a Certified Public Accountant (CPA), holds certificates in leadership development and manufacturing excellence, and has a Lean Green Belt.